During this “Partnered in Marriage” series we observed the Ideal Family in Genesis 1-2 and saw that God blessed both the man and woman with mutual commands and responsibilities. We also examined the Fallen Family of Genesis 3 and following where united harmony broke apart as sin entered the world. We then looked at the Redeemed Family in two recent posts. We studied how, through the cross and resurrection, Jesus restored the family and the possibility for godly unity. In a later series, I will discuss the “difficult” passages in the Bible related to the marital relationship. 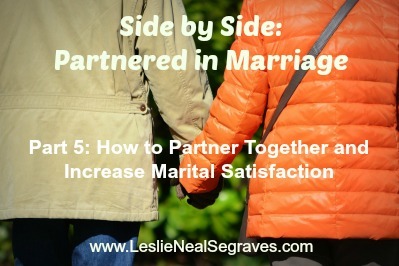 However, in the final post of this series, I will simply share how partnering together can increase marital satisfaction. Sound too good to be true? Chad and I both love sports. I remember being newly married, and we were running on our seminary campus. We came to a road split where we could either go right or left around the perimeter of the school. One of us asked, “Which way do you want to go?” Instinctively we glanced at each other and both turned opposite ways. We both began sprinting knowing that we HAD to run faster than the other. I remember laughing running. When we got together again, huffing and puffing, we both were laughing and smiling. I distinctly remember Chad saying to me, “I am so glad you love to compete! That makes me happy.” I thought the story was hilarious and shared it with an older woman (I laugh now because she was probably in her 40’s). She did not think my story was funny, but said, “Leslie, you did wrong. You should have gone the way Chad went. That’s the way marriage works.” I was shocked and a bit frustrated because I am, by God’s design, competitive, and I love speed. Now, I had to change that? Honestly, Chad and I are not where we want to be in our relationship. We have many areas to work on and currently, we are in one of the hardest seasons of our married lives. With a newly adopted baby and two other young children, with a growing ministry that engages in areas of the world devastated by evil and natural disasters, we are feeling a lot of tension. Yet, we know that by God’s power in us, he can help us to partner together despite these challenges and our marriage will grow strong and deep. So for those of us who seek to be inter-dependent with our spouse (not one-sided), how can we partner well together and increase marital satisfaction? There are lots of ways, but here I offer four brief areas related to partnership – mutually sharing dominion on the earth. There in the midst of “bones and headstones” we talked about how we had learned to die to ourselves over the first year of marriage and what areas were still alive. We washed one another’s feet and committed to serve the other. Of course, we actually created a competition – who could serve the other more. And we’re both fighting still about who won. Yeah, we still have much to learn. 2. Realize that “your gifts are mine.” As people who love to compete, we had to grasp that we each had gifts and talents from God that the other probably could not exceed. Realizing this fact is not selfish or coveting, rather we are each blessed by the other’s giftedness. For example, Chad is exceptionally gifted in languages which is a needed gift in our ministry. No matter how much I study, I cannot surpass his ability to naturally hear language. He can travel and know when language dialects change even though he doesn’t speak the language. I learned early in our years overseas to embrace and encourage his gift of language. It served God, and it served me! I didn’t have to try to be better, but as one flesh I could claim that gift as my own! 3. Pray apart, then come together. One of our favorite ways of partnering together is through praying for the same thing both separately and together. Through this strategy, our hearts are drawn to God and one another. There is something about hearing a spouse pray that makes you realize that truly at the cross we are equal. We are both hurting and struggling and trying to make sense of life. Chad does not have to come to me with a full plan in place. I do not have to come to Chad with a full picture of our future. Rather, together, we seek God and trust that He will speak to us as individuals and as a couple bent down at His feet. He just will. Period. Currently we are in this place. Neither of us feel we are hearing God well in several areas where we need to make decisions. So we have entered into a week of spiritual disciplines so that God can hopefully sharpen our ears and eyes. But ultimately we are simply asking to hear the voice of God. I know that at the end of these days set apart, when we share insights from the Lord, God will again amaze us by speaking similar things to both of us! This, my friends, increases marital satisfaction as you realize you are beside a spouse to follow God – from the hearing to the doing. 4. Serve together. God works in a marriage when husbands and wives serve others together. Sure, vacations are fun and playing together is healthy and needed in marriage (we certainly need improvement here.) But by serving together and looking outward together, I think God binds the hearts together with deep and abiding stitches. Watching your spouse serve another person in need will cause your love for your spouse to increase. God always blesses obedience, he always blesses faith. A couple who walks in faith together leans into one another as they lean into God. By serving others in need together, we experience greater connection to the heart of God. Find a way to serve together. Invite neighbors into your home who don’t know Jesus, prayer-walk your neighborhood and ask people how you can pray for them, or serve in a local ministry. These are just four ways to partner with your spouse. Try one of these this week with your spouse and see what happens. Would love to hear from you! Join the Conversation: Which of the four areas would be most fun for you and most challenging for you? Why?